32 members of the Clare-based Burren Cycling Club will take on one of their biggest ever challenges to date later this month when they attempt to cycle the entire length of Wild Atlantic Way in just five days. Burren is the first cycling club to undertake the 2300-kilometre long route in a continuous relay between April 30th and May 4th. Their journey will be recorded using GoPro cameras while live tracking GPS will enable members of the public to follow the group’s journey along the Western Seaboard from Kinsale to Derry. 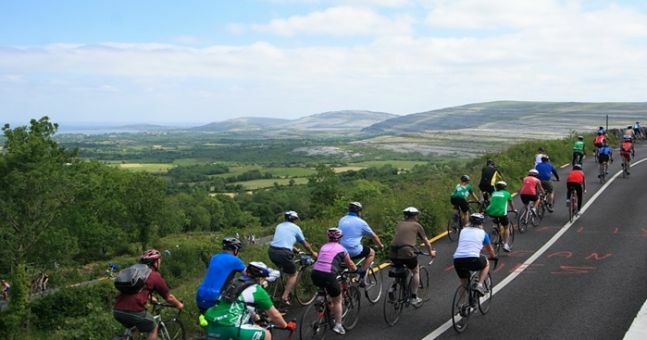 The cyclists will pass through the Wild Atlantic Way’s 15 Signature Discovery Points, which include Old Head of Kinsale (Cork), Skelligs View and Blaskets View (Kerry), Loop Head and Cliffs of Moher (Clare), Killary Harbour (Galway), Keem Strand and Downpatrick Head (Mayo), Mullaghamore Head (Sligo), and Malin Head and Sliabh Liag (Donegal). Day One of the cycle will see the group make the 500km trip from Kinsale, County Cork, to Tralee, County Kerry. On Day 2, the cyclists will embark on an equally long journey from Tralee to Galway stopping off along the way in the Club’s home town of Ballyvaughan in North Clare. Next up will be the 500km trip from Galway to Ballina, County Mayo, on Day 3 before the group takes on the mammoth 600km cycle to Buncrana, County Donegal. The last leg of the journey will see the Burren Cycling Club members travel around the coast of the Inishowen Peninsula before reaching their final destination in Derry. “All going well, we look forward to becoming the first Cycling Club to successfully cycle the entire length of the 2,300km Wild Atlantic Way. The experience will also help our members prepare for the Tour de Burren which is coming up this June,” added Mr. O’Donoghue.